​SAN ANTONIO - The disposable income of 77,659 employees working at Joint Base San Antonio—across the military bases that include Randolph Air Force Base, Lackland Air Force Base and Fort Sam Houston—was about $17 billion in 2015, according to a report calculated by the Texas Comptroller’s Office. In 2012, there were 83,100 employees across Joint Base San Antonio so there’s a slightly smaller footprint today. 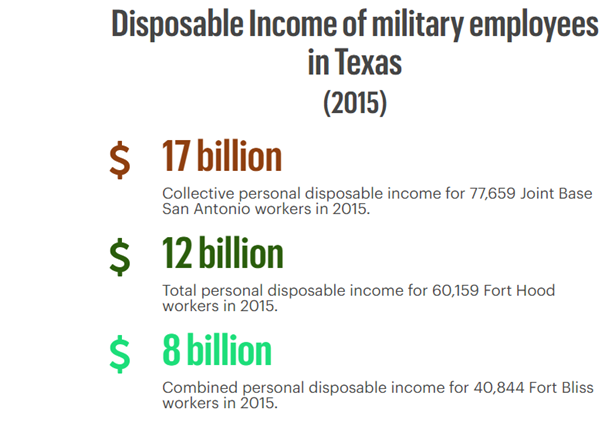 Although that workforce has shrunk a bit since 2012, when there were 83,100 employees across Joint Base San Antonio, it remains the U.S. military’s largest collective footprint in Texas.